For those of you that watched the Google+ Hangout I was in you know that I have Chalk Painted pillows. For those of you who didn’t see it and would like to, you can watch it here. And why, yes, that is indeed my face frozen in that lovely expression on the main screen of the video. ;) I was thinking as I was talking (dangerous)…and don’t your eyes roll up when you are deep in thought too? 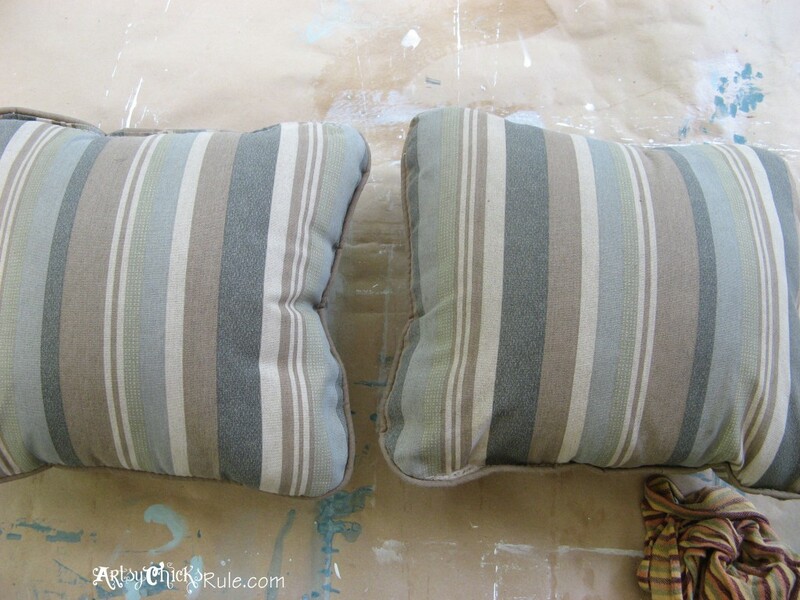 Yea, well okay…onto the Chalk Painted pillows…..
Yep, I painted em. Aren’t they so much better? This set of outdoor furniture we actually picked up at a garage sale last year for $175 (loveseat, coffee table, 2 chairs, 2 ottomans). Awesome find. It was in great shape but the cushions were a bit dirty (I bleached them, all good) and the pillows were a little worse for wear….and not really the style/color I wanted. 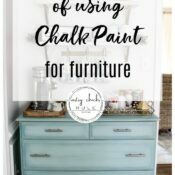 I had heard of people painting upholstery with chalk paint, so I thought, what the heck? I don’t like the pillows anyway….and I am the one who painted lampshades with chalk paint, after all. So I mixed up some Annie Sloan Chalk Paint—-> Duck Egg Blue, mixed with a little Pure White to lighten it up a bit. I also mixed in a bit of water to make it soak into the fabric easier which helped a bunch. You can also spray the fabric with a water bottle to dampen it and that will help the paint soak in too. Isn’t that just the most soothing color? Duck Egg is great anyway but mixed with some white it is just fabulous. I did put a coat of Clear Wax on them after they dried and it made them so soft. They were a little um…”crispy”?…not the right word but I can’t think of a better one at the moment. It was like night and day once the wax was applied. And here they are completely finished…..NICE. I love my “new” pillows. 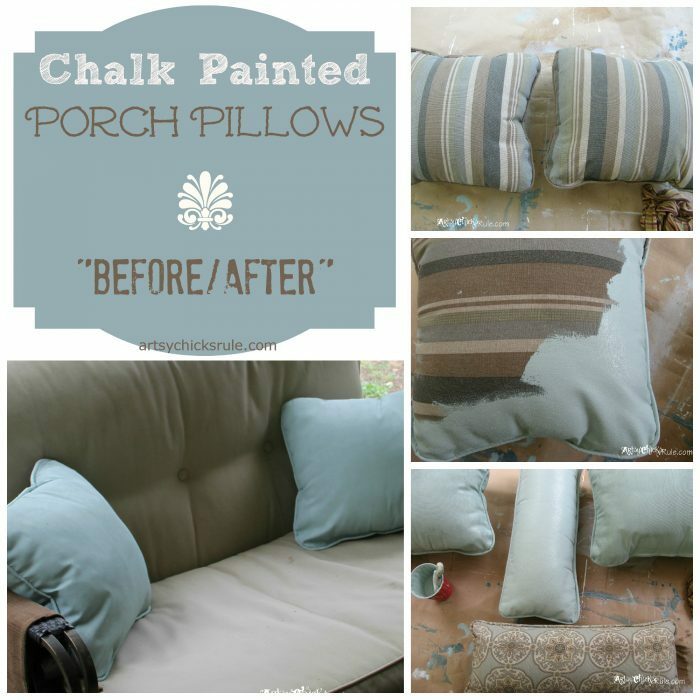 PIN these Chalk Painted pillows for later! I also have a bunch of posts coming your way over the next month or so. I sat down today and organized, watermarked and made ready the photos of my many projects. I just need to write posts and then I can share them with you all. There are about 12. I have at least that much or more of what is incomplete still. Like I said, lots going on around here. So stick around…some really fun stuff & tutorials coming your way!! You don’t want to miss it! Oh, and you can follow me on Instagram (if you don’t already) as I post lots of snippets of things I’m working on, as I’m working on them, long before they make it to the blog. (and some things that never make it to the blog!) Plus some random glimpses of daily life too. So whatcha think? 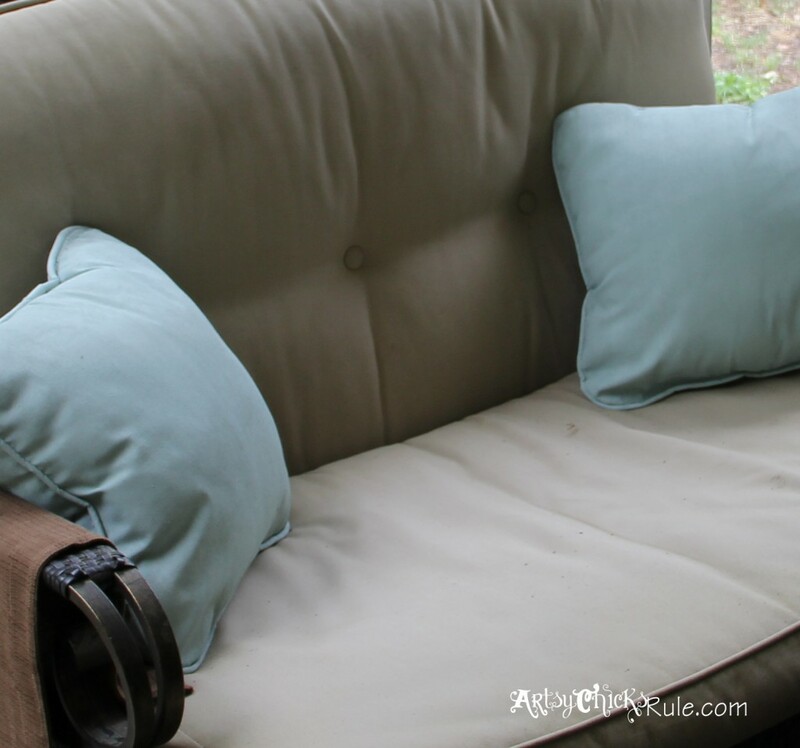 Paint some cushions?? Maybe a chair or two? Yes? 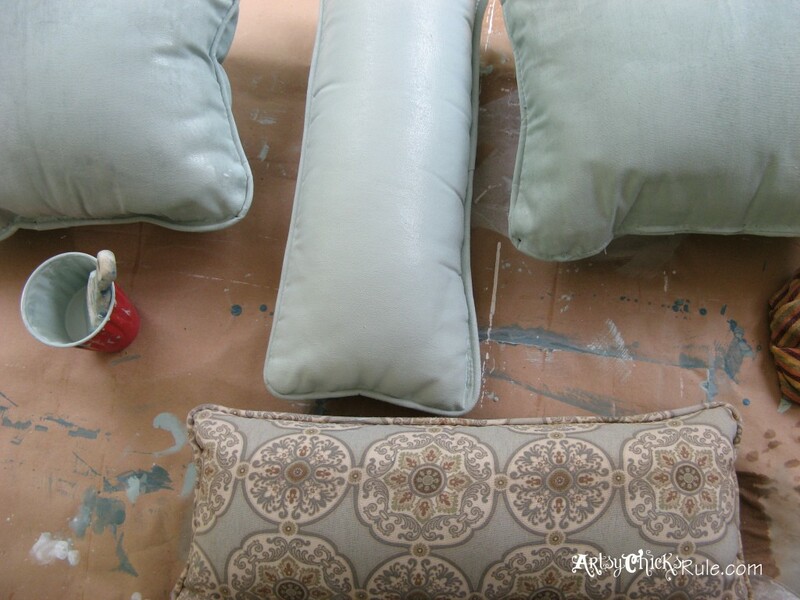 Those pillows look great…gotta find some Annie Sloan chalk paint!! 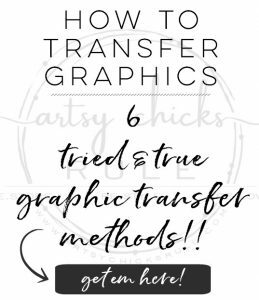 I’m suprised you didn’t stencil on a Graphics Fairy design!! Hi Vickie!Thanks so much! :) Haha, yes, …no Graphics Fairy graphics on these ;) BUT I did consider a stenciled design! I’m not positive now since I did those quite a while ago. But best practice is using a pretty firm bristle brush. 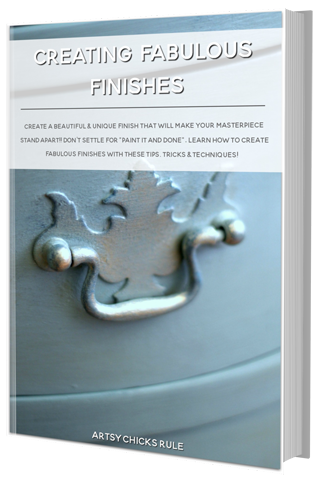 You want the paint to get “into” the fabric, not lay on top and a firm bristle will help achieve that. What a great idea. Thanks so much for sharing that tip. I would have never guessed you could paint pillows and still have them soft. I was surprised about applying the wax. I thought it might leave a residue but evidently not. Kudos to you! Thanks Vickie! No, the wax doesn’t leave a residue. It goes into the paint nicely. I was really surprised at how differently they felt after I applied the wax! Hi Marie :) Yes, the coverage was great but Duck Egg in general has fantastic coverage! And yes, it was a bit crisp until I waxed it. I was actually shocked at how different it felt afterwards. yesterday I painted 4 pillows AND a duvet. I hated the thing anyway and since I’m addicted too I needed my paint-fix haha. Now mine are ‘crispy’ as well. 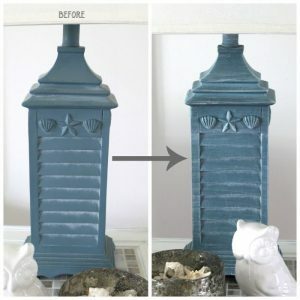 I would have never thought about applying wax so thank you for sharing your project here. What I still wonder about is what did you do afterwards. Doesn’t the wax become sticky? Have a lovely day and loads of fun colouring your surroundings…. You can oh so lightly sand with very fine sandpaper before applying the wax. It will help to soften them up. Then apply the wax. Be sure you don’t apply too thickly. (if you apply too much, yes, it can be sticky-ish) If applied correctly, the wax will further soften the material and give a protective finish. It will “dry” (cure) and won’t be sticky and won’t rub off. 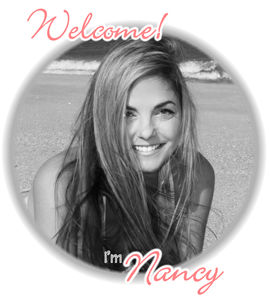 Hi Nancy, love your pillows! 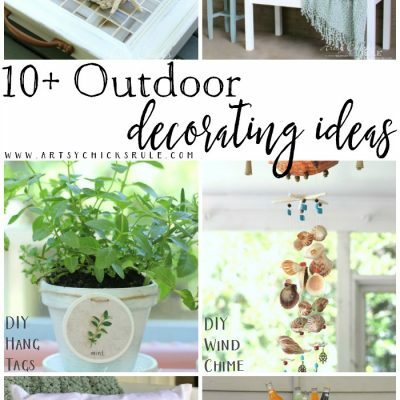 Thanks for trying a fabric project with our addictive Chalk Paint®, and had a great time with you at the Hangout! Hi Debbie! Thanks so much!! Yes, it is addictive, for sure. ;) It’s what I reach for first almost every single time I go to paint something now…no matter what I’m painting. I just love it. I’m excited about the new Yellow!! I would have never thought to paint fabric. I would have just sewn new covers for the pillows. What an awesome idea! Opens up so many opportunities! 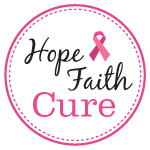 Thanks so much for sharing this inspiring post with all of us! they turned out great! 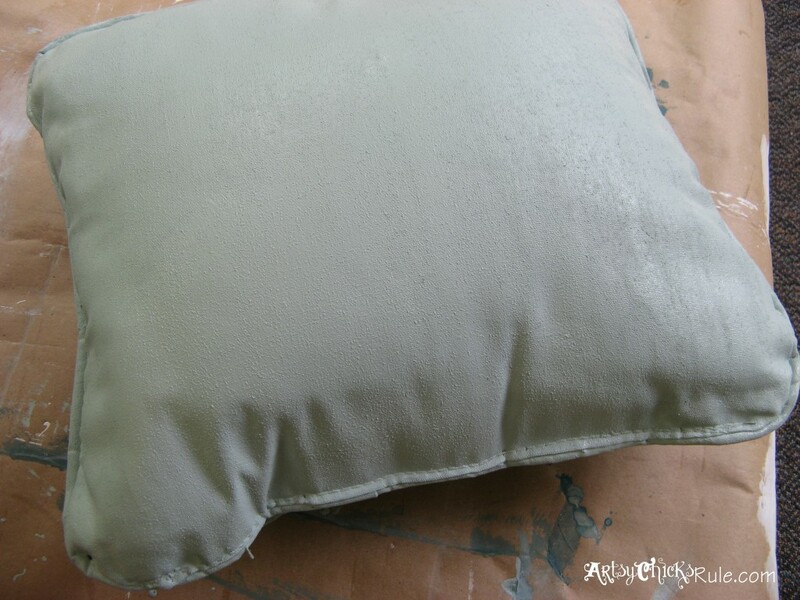 do you worry about lounging or putting your head on the pillows since they are sealed with wax? Hey Jessica! Thanks so much :) And nope, not at all. The wax is “dry”..or cured, whatever you want to call it. It just feels sort of like a soft, leathery pillow. And water resistant..can’t beat it! 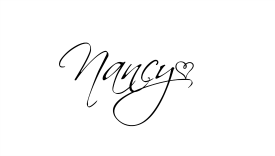 Love it Nancy! Can’t wait to see it all! AND did you see today that Instagram now has video?! YAY! These look great! 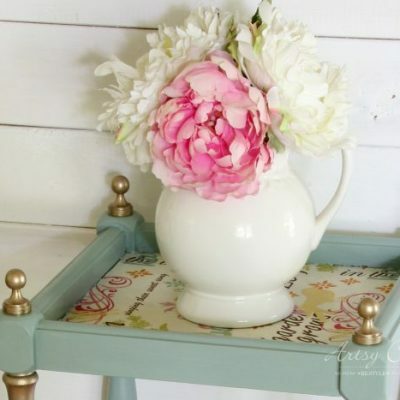 Love me some Annie Sloan! I’m going to feature on my fb page tonight. I love the look of the painted fabric. I would like to try a chair. I know you guys mentioned this on the Google+ hangout, but I didn’t believe it until now! What an awesome transformation! I can’t believe you can paint pillows! They look so good! I can’t wait to check out all of your upcoming projects! Okay I totally love this! I can’t believe how well they turned out. Well, I should believe it- I painted a garage sale wing chair for my Kindergarten classroom last summer… and added bright buttons over top of the tufted buttons. Worked out so well and is super cute – but totally crunchy for sure. Hmmm… wonder if chalk paint works that much better on fabric than regular ol’latex. Or is it the wax that does the trick?? I really need to try the “real stuff” one of these days as soon as I can get my hands on some. So curious about the difference! Awesome fix up Nancy, I’m totally impressed!! Can’t wait to see your other twelve projects (I know EXACTLY how that feels – I totally have decorating A.D.D.). Thanks! !Oh so cool you painted a chair. I hadn’t done any kind of upholstery (besides lampshades) before this one. (I don’t think I did anyway! ;) ) I’d think the chalk paint would work better because latex has the acrylic in it that I think makes it sort of “rubbery/hard”. 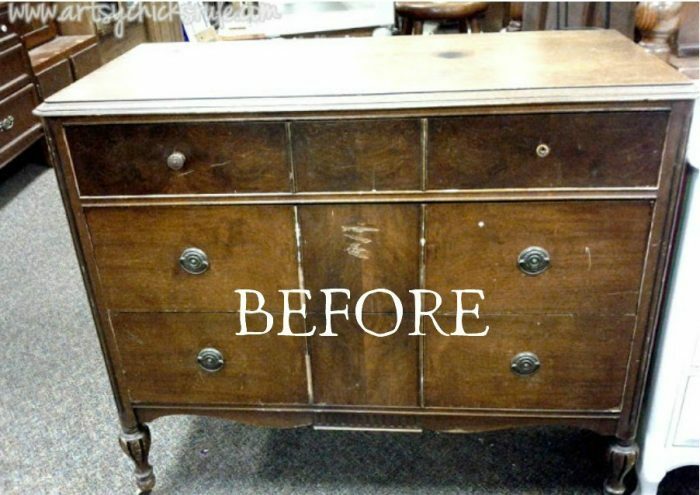 The chalk paint really soaks into the fabric very well….and then the wax softens it up (and seals it). The pillows look great Nancy! have an upholstered chair that I’m thinking about painting….I just gotta work up the nerve to do it! I’m just like you, so many projects going on! We’ll never be done will we? ; ) I can’t wait to see what you’ve been up to! Thanks so much! I’m a paint enabler so I say go for it! ;) I don’t think we will ever be ‘done’ with projects. It’s just not how we are wired!! Must have much going on at all times. 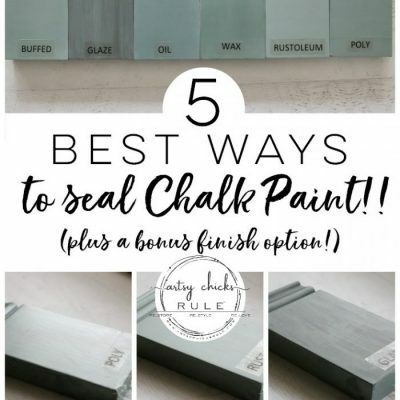 I found a place about 30 min from me that sells Annie Sloan chalk paint…that’s a big uh oh!! LOL Your pillows turned out great, Nancy!! I have some patio furniture that needs some TLC. Thanks Denyse :) How awesome (and yes, trouble! ;) )! I have been ordering but a store about 10 minutes from me just started selling it! Those look great! 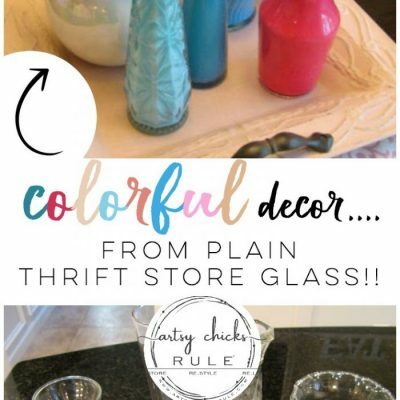 I heard that chalk paint does great on fabric and it’s nice to see you tried it. I have two chairs I am going to try that on. Thanks Lorraine! It really does work well. 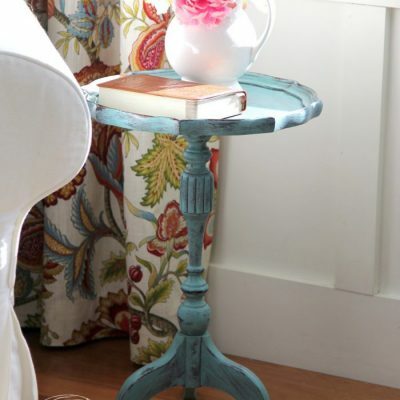 The chalk paint soaks in so nicely to the fabric. Can’t wait to see how yours turn out! Wow, this is fantastic! I have a slip covered couch that is need of recovering but the price of a new slip cover is so high. Do you think painting a whole couch is a good idea? Or is that crazy? how many cans of paint will it take to paint 7 foot couch ? Most likely much less than one. You would want to mix it with a bit of water…and maybe spritz the couch with water before applying. That will help with absorption. I haven’t done a piece that large yet so I’m just guessing here but hope that helps. I watched the HOME TALK through your link and found it interesting….. but one question….. you mentioned that you wax most things unless it is going outside….. I can understand that the wax might be impacted by the sun and heat but would it not also provide a slight protection from the elements? Just wondering the logic/reasons. Hi, yes, the sun would affect the wax somewhat and yes it would also protect it somewhat from the elements, I suppose. My pillows are outside but on a covered & screened porch (not in direct sunlight) so I waxed them. The thought behind painting things without wax outside is that it will age and “weather” naturally. (the paint won’t just wash away but will weather as time goes) I have some ceramic tiles on the top of an outside bar top (out on my patio) that I’ve left un-waxed. I painted them with the Chalk Paint and then buffed them a bit with a dry cloth. They are holding up well so far. You just opened up a whole new world for me!!! What would you think about me painting my couch with some ASCP?!?! I’m 40% in. Just need to find posts that say go for it ;D. Maybe I’ll start with pillows. You are so smart to come up with this technique! I can’t wait to try it for myself. Thanks Paula!! They have really held up great too! oh my stars!!! I have a patio set I bought from craigslist as well, but like yours, cushions and pillows are kind of nasty! 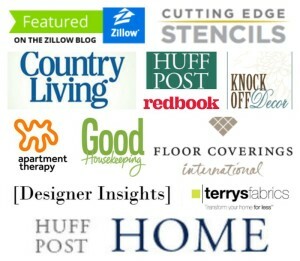 last summer, I considered spending, I hate to say this, hundreds ..yes multiple.. on covers from etsy. not only that, but I was just about to give up on my ASCP after a project I just tried with it! Well hey!! ;) Thank you Makenzie!!! Oh yeah…change that stuff up! 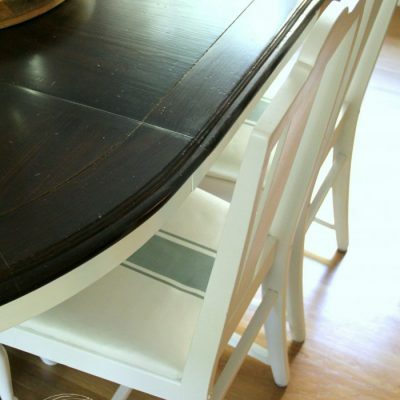 Don’t spend all that on upholstery…paint it! Mine are outside in the snow right now (blowing in through the screens) and are perfect. Really. They have held up great so far. Stay tuned…I’ll be posting the chair in a week or two! Hi Nancy, I reupholstered the base cushion of an outdoor chaise which was in the worst condition of my set. I hope to do the rest of the base cushions over the course of the summer as they have small tears. The back cushions look tired and faded, but intact. Upon seeing your pillow post, I put 3 coats (50% water/50% paint) after spraying with water, on all of the back pillows over the course of a dry and sunny Colorado day. It looks great. The local ASCP store advised against waxing (? ), but because the set sits on an exposed deck, I believe I need to for rainy days – right?? 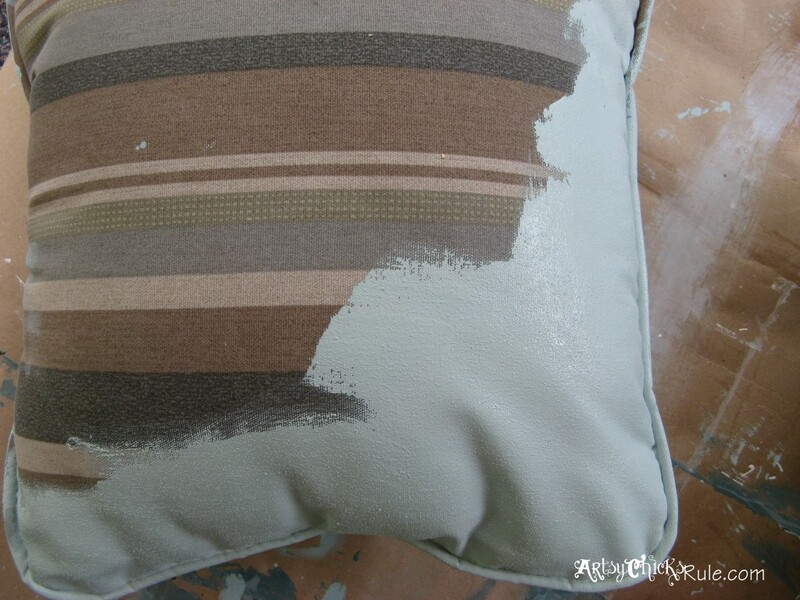 This store also advised to soak each cushion in a 20/1 (water/paint) mixture which never would have affected the fabric, so I am reluctant to take their advice for this project. I am too nervous to leave the cushions outside in case it rains now and don’t know if I should take the waxing step or not. Please let me know what you think. I could find no other outdoor fabric posts on this topic. Thank you! Yes, they are correct about the wax in direct sunlight. The wax will “melt”..and won’t hold up well if directly in the sun. Mine are on my covered screen porch and do get occasional sun but not directly. They’ve been fine. Now, soaking the cushion? I have never heard of doing that. What did they say was the purpose of that? 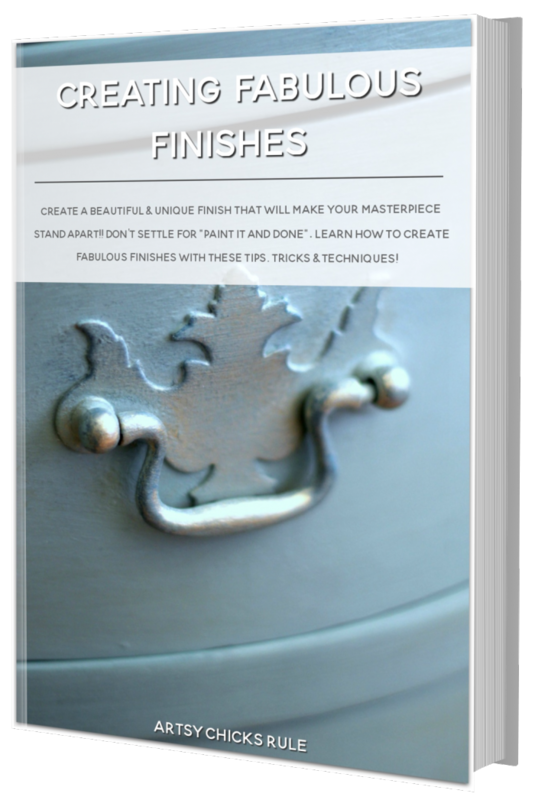 Typically, for anything that is going to be in the weather or sun (wood, ceramic, metal, etc) it is advised to leave unfinished (unwaxed) and it will ‘weather’ naturally. I did some ceramic tiles I have on a bar top last year and left them unsealed. It didn’t wash away like you would think. They just have a very matte finish. I don’t know how that would work with fabric though. You could leave one cushion out and see how it does. One suggestion I can offer is this (since I don’t know of another way to seal them besides wax and poly…and I definitely would not do poly) … ‘buff’ the fabric that you painted with an old rag (or even better, a large waxing bristle brush if you have one) Buffing it may help to “seal” it a bit. You could try that and see. I have to ask, all this time later, the pillows are still holding up? I saw you did this to some chairs as well. I have a loveseat I inherited from my parents and it’s in decent condition, but it’s just…. ugly. Not my style at all! I wonder if I should try this method of restoration. Hmm…. I wouldn’t recommend painting anything that gets daily use (well, the pillows did get quite a bit and are great) like seating. I would reserve this for those pieces that are used only occasionally. It looks lovely, can these cushion covers( chalk painted ) be mqchine washed ? Just out walking the dog and I spotted some cushions by the side of the road. I grabbed a long one (West Elm) & one of the (6?) individual seat cushions. I brought the dog home, grabbed a quick 15 min. lunch & drove back to the house to get the others – unfortunately they were gone. B/c they were gone so quickly, I rang the door bell to check if they were intended for someone. No answer. Anyway, you said that you bleached your cushions first, what exactly did you do? I’m just wondering would that be necessary since they will be covered in paint? I am having a garden party in less than 2 weeks & thought painting would be the fastest thing I could do. I have a well constructed upholstered chair with lovely ornamental carved wood, in good condition, even the fabric upholstery. But, it’s in a MOST unfortunate color… a hideous greenish gold (popular in late sixties) which I truly dislike! I have been contemplating painting it a rich deep turquoise to fit my decor, just hoping ASCP comes in that color! I will be looking around my area for a place that sells it. Your cushions look GREAT and seem to have held up well over time. This chair will not get daily use, so I think it should be fine. Just have to find the paint, and then my courage! !